Ecce Homer. 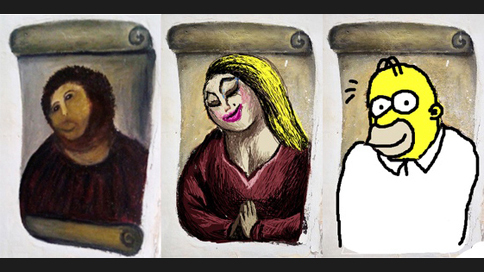 The patriarch from The Simpsons is just one image created by participants in BBH London's sarcastic Cecilia Prize competition, honoring the world's most infamous amateur art restorer, Cecilia Gimenez of Spain, who made headlines for ruining Ecce Homo, a 19th-century church fresco of Christ she was attempting to, um, resurrect. Folks looking to waste time online—that means all of us—can have a go at "restoring" Elías García Martínez's religious painting themselves, thanks to a simple and fun site engineered by Viv Yapp and Ak Parker. Visitors can "paint over" the masterpiece in any way they see fit, and tweet the results (along with #ceciliaprize) for a chance to win a poster of Gimenez's version. To my eye, her effort is pretty striking, like a post-modern, neo-expressonistic reappraisal of its subject, open to many interpretations, scarred by the irony surrounding its creation. Or else it's a ruined picture of Jesus. I say tomato, right? The Cecilia Prize entries are a mixed bag, with less random weirdness than I'd have expected, and lots of humor, horror and some surprising social commentary (insights, perhaps, into our collective consumerized, celebrity-obsessed psyche). So far, visitors have drawn heavily on pop-culture and media references, with some themes—such as Batman and related characters—appearing numerous times. They've also re-imagined Christ as Superman, Spider-Man, the Mad Men Draper silhouette, the white-skull-masked killer from Scream, Peter from Family Guy, Kenny from South Park, Ronald McDonald, Google's Android icon, Teenage Mutant Ninja Turtles, Darth Vader, Robert Smith of The Cure, TV clown Bozo (Ecce Bozo! ), and a great many more. One submission is literally Divine—with a capital "D," as in the cross-dressing star of John Waters' cult films. Aging (but heaven knows, eternally relevant) rockers Kiss seem disproportionately represented. There were, when I last checked, three likenesses of Gene Simmons and a Paul Stanley. What, no Ace Frehley? Blasphemous! Via Creative Review. Also, after the jump, check out an image from Reddit explaining how advertising is like the Ecce Homo disaster.